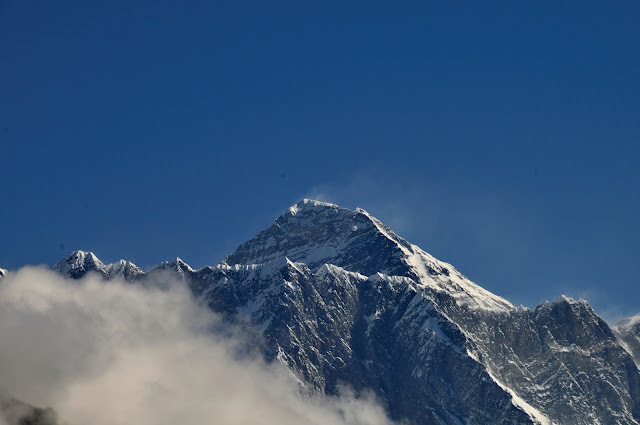 To the Nepalese, the highest mountain stands at 8,848 m is Sagar Matha, and to the Tibetan it is called Chomolunga, but to the world it is known as Everest. 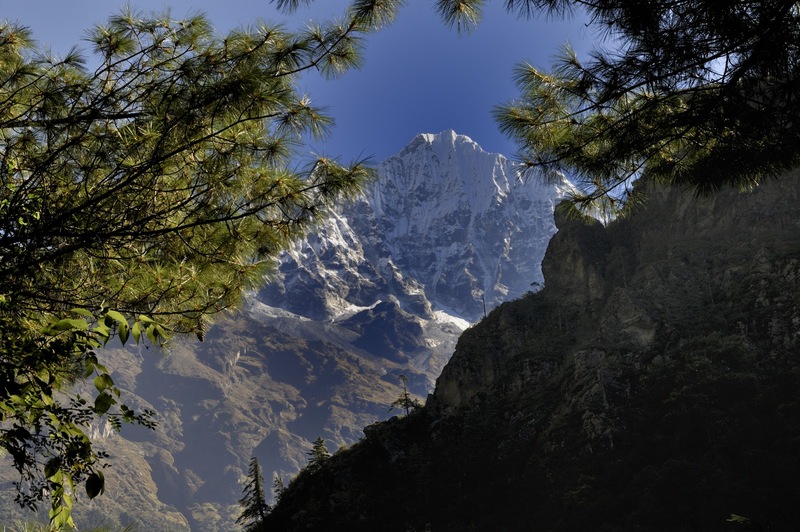 Named after a British Sir George Everest. We have planned this trip for almost a year, and we have chosen October period as this is the best time of the year to attempt to climb to Everest Base Camp. 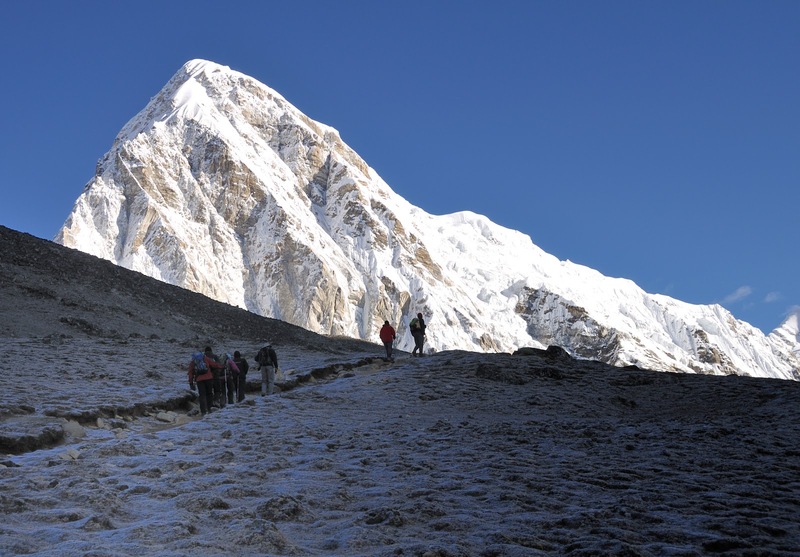 Our journey will end here, but to those that proceed to the Everest Summit, this is just their starting point! 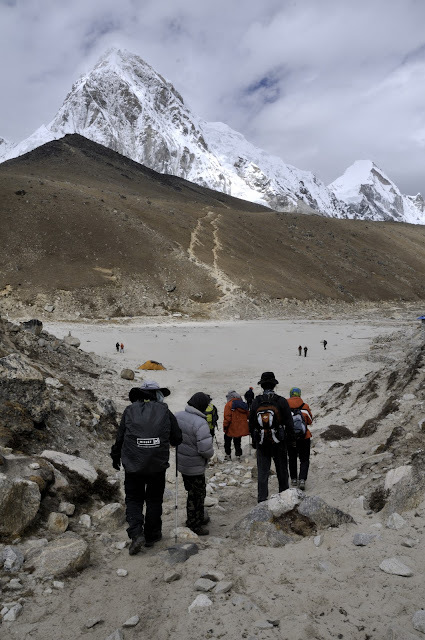 Having cover this journey in that many days, feeling exhausted and only up to 5,600 m, I can but have the deepest respect for these people that have attempted and will attempt the Everest Summit. 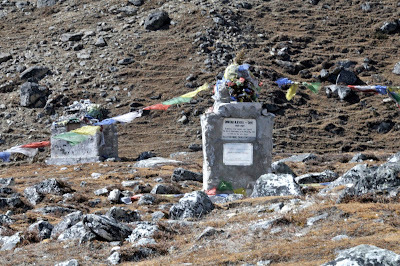 Along the way, we saw many stupas, some build in remembrance of conquest, but many in remembrance of fallen heroes that somehow perished in their quest to reach the roof of the world! 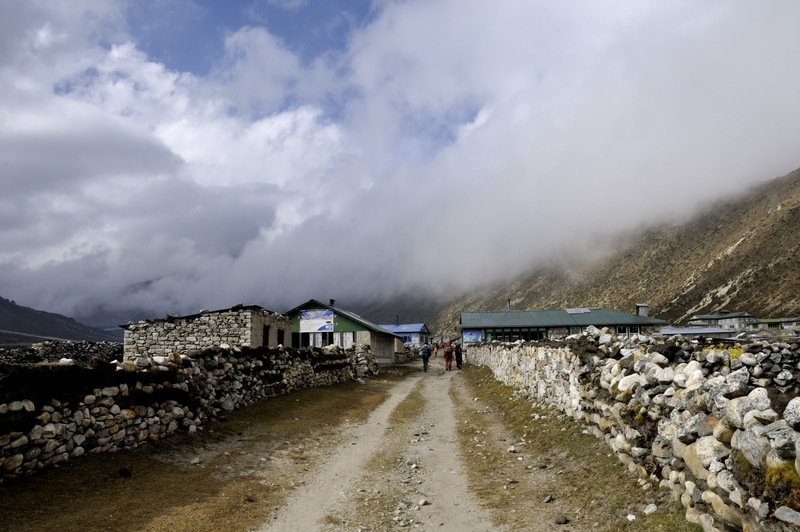 The airport at Lukla also known as Tenzing-Hillary Airport is one of the world top 10 Extreme Airport. Known for its short runway, situated on a slope and foggy weather. 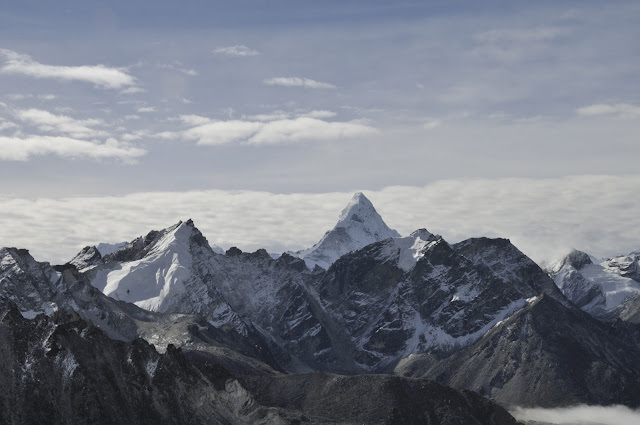 Journey to some of the highest mountain on earth, requires one to land in this airport. And this we did, with turbo-prop planes from Kathmandu. The video below will give you a good idea on this airport. Many years ago, I read in one of the scientific magazine where they were contemplating on slope leading to the airport terminal. The slope will assist in slowing the plane down thus saving fuel, and at the same time assist in taking off when the plan rolls away from the terminal. Well Lukla airport is “designed” in such manner. The start of our journey at Lukla located at 2858 m above sea level. A quick stop for lunch, and we were off to Phakding. 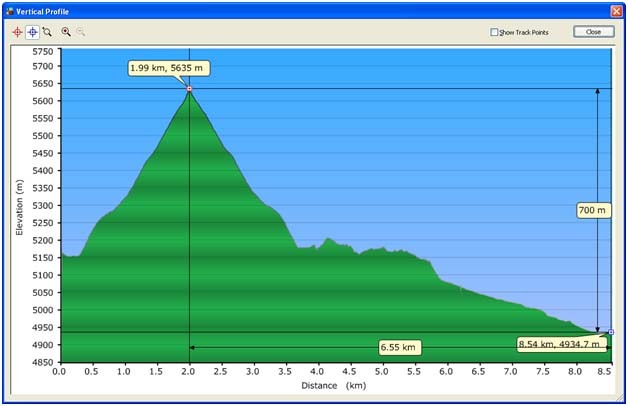 The profile of our journey can be seen, and it is downslope to 2636 m. Naturally, behind most of our mind was the fact that on our return journey we have to make this 220 m climb to Lukla! 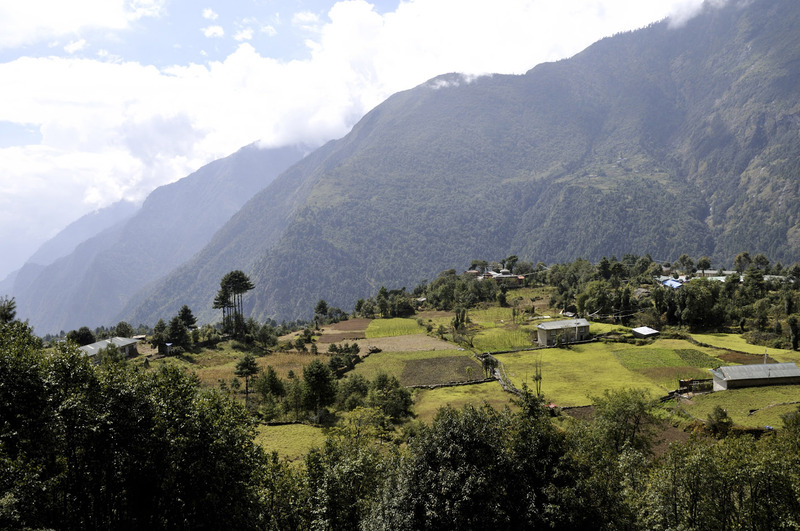 Lukla is the starting point for most of the scenic routes in Nepal, and is also one of the bottleneck in all the traveller's itinerary! There is only one quick way in and out, and it is through this airport. 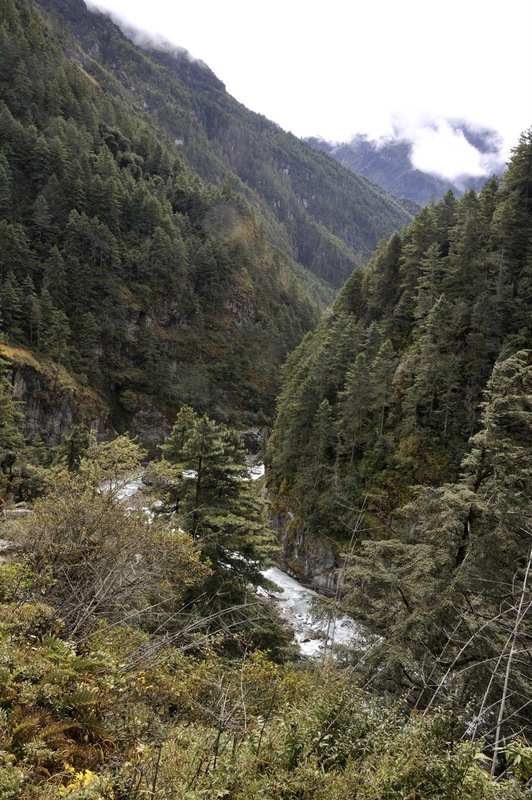 Ever since the Maoist rebel has dropped their arms and became part of the government, the tourist industry has picked up, and making Lukla a very busy place. Our chief guide, we learnt has to spend 3 years in Malaysia to work during this turmoil period. He was thankful to be back to his homeland and bringing city folks like us to view his beloved country. 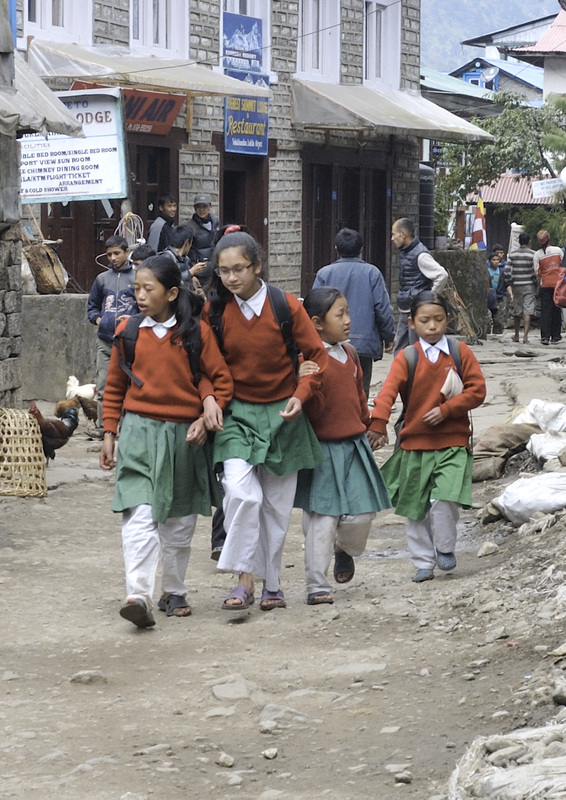 School Children going to school. Very interesting uniform. 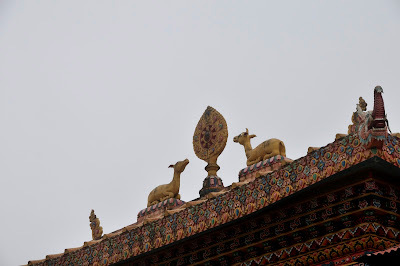 Throughout the journey, one will see many prayers engraved or painted on rocks and walls. Flowers grow in abundance despite the fact that it is Autumn! We awoke to a beautiful morning, the ray from the sun just strike the mountain in front of our camp site, and to the early birds we were rewarded with this majesty view. The reality of "Opening the Door to see the Mountain" - that was our reward on this morning. 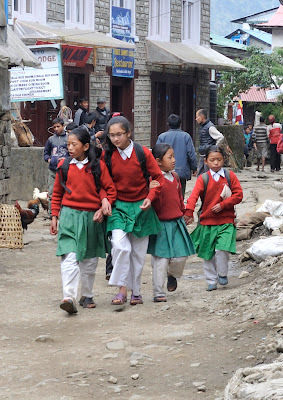 Our daily routine was standard, waking up at 5:30 am, breakfast at 7 am and onward trekking at 8 am. For me it was 5:30 am as we retired early the night before. After all, what is one going to do after the last light and long walk, sleep. Green vegetables grow very well in this altitude. In fact such will be our staple for the next 14 days! This is either cabbage or Cauliflower, both of which we have in abundance on our dining table! There were many young ones along the way, are they deprived? Definitely not, they are not under nourished, in fact they look healthy and fit! 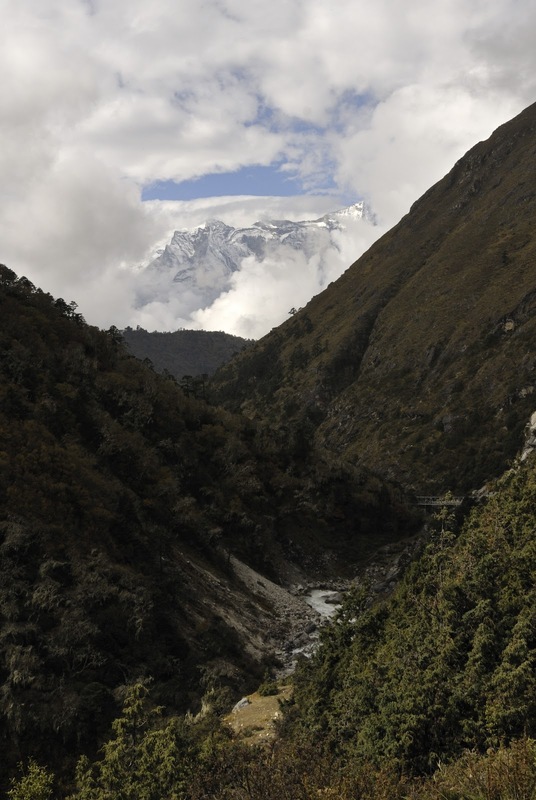 Along the trek, when the treeline breaks, the majestic mountain is reviewed. 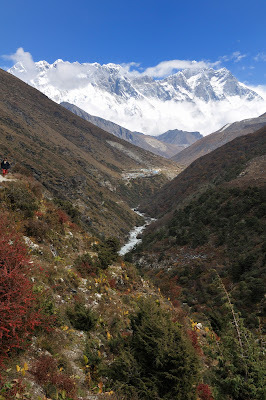 This is Ama Dablam at 6,812 m.
We criss-crossed the Kosi River in many points, at least 5 suspension bridges from Phakding to Namche. One of the most grueling climb in this 14 days journey, thankfully the attitude is below 4,000 m, and breathing is still easy. 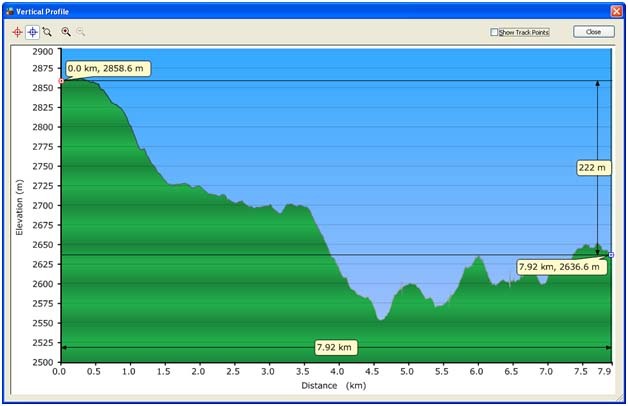 From the climbing profile, the last 3 linear kilometer was most tough! 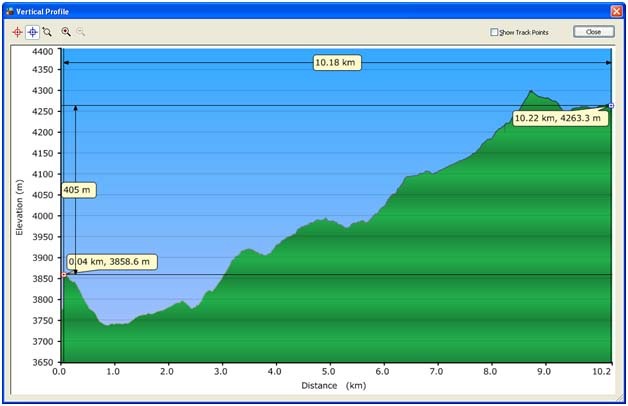 Very little respite, as it was climb and more climb. The beginning of the grueling climb offered us a majestic view of the last suspension bridge we were about to cross. The final Suspension Bridge but a long way up to Namche. The beginning of our Climb! The Suspension Bridge up close. Drawn from our Kilimanjaro experience, we have to allow our body to get use to the high altitude, and we rest one day here. Awaken to a misty morning, but a break in the fog and cloud to review the mountain peak from our camp site. 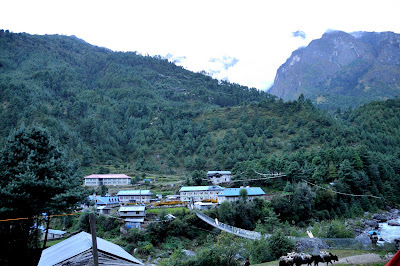 Namche Town as viewed from our camp site. By 9 in the morning, when the mist was just lifted - the mountains surrounding Namche were reviewed. Group Photo of the members. After breakfast and before shopping! Not too sure why they are crouching in this manner, it was not that cold! Namche Bazar (bazaar), the place where merchants bring their goods from across the country, especially from Tibet to sell their goods. For us, it was a good opportunity to see the tribal folks coming together to buy and sell. 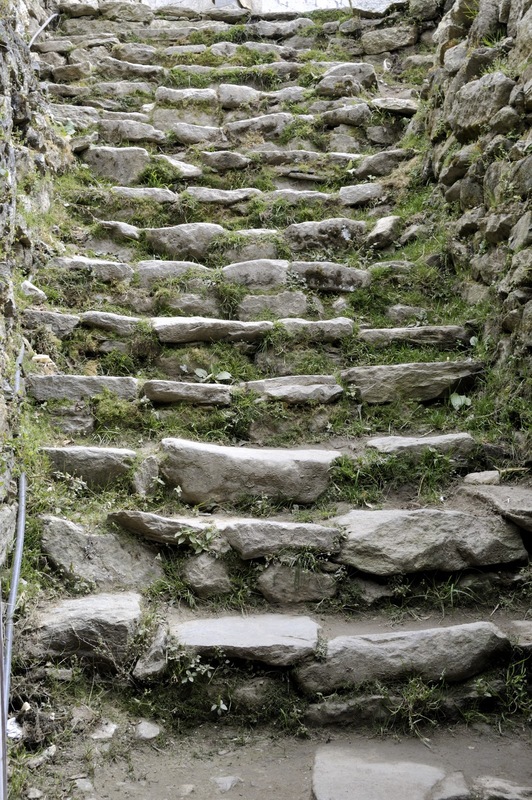 The many steps of our journey. Pot and pan, just about anything can be purchased here. After the grueling climb, it was off to Tengboche. On this day, we were granted a fantastic view of Sagar Matha (Everest). The mist was coming over fast, most of us were fortunate to catch the glimpses of the highest peak, but not all were fast enough to capture as image. We finally got to see Mt Everest. The first snow peak on the left. Ama Dablam is partially hidden on the right. A few seconds later, the mist was rolling over the mountain range, and soon shrouded it from our sight. And the mist rolled in to shroud the mountains from our view! There will be many more steps in our journey! But the views are worth are fantastic. As it was October, the Autumn Colurs can be seen in the non-deciduous trees. 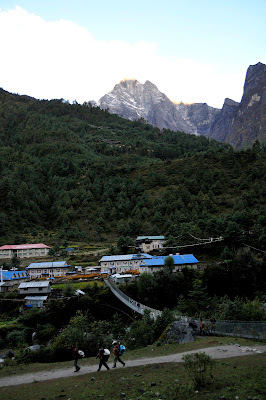 We arrived at Tengboche, where a huge monastery reside. 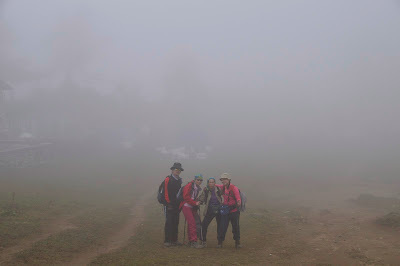 Arriving at Tengboche, the place was shrouded in mist. Our arrival in the foggy plain. A summary of our climb from Namche to Tengboche. In the wee hour of the morning, the morning will be chanting and blowing the horn, awakening those who still were asleep in their tents. Save those with ear plugs on, that required a good shake to ward off the sleepiness. 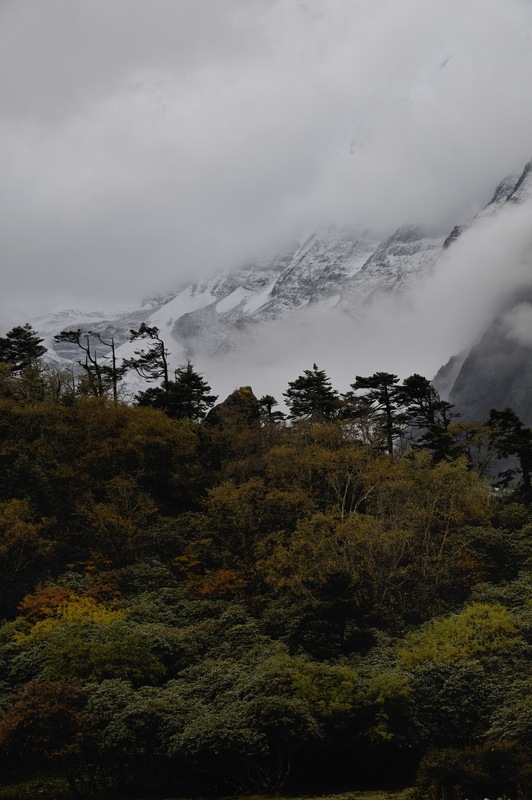 Again this morning, the Tengboche Plain was shrouded in mist. 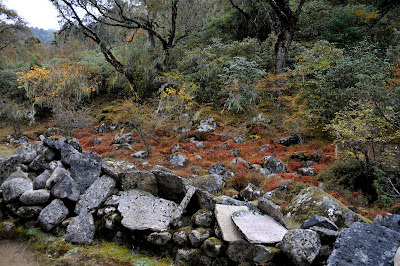 The journey to Pheriche was an exciting one, as the path was flanked by autumn colours. 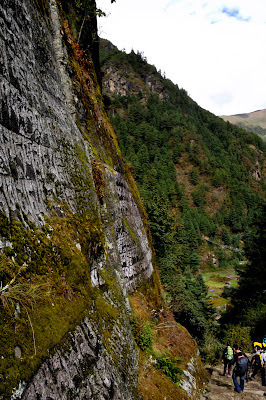 Trees started to get scarce, and moss and lichen starts to dominate at this altitude. Many stupas dot our trail. Phariche - One of the few places along our route that has a Medical Centre. Once again, we have to allow our body to acclimatize to this high altitude. 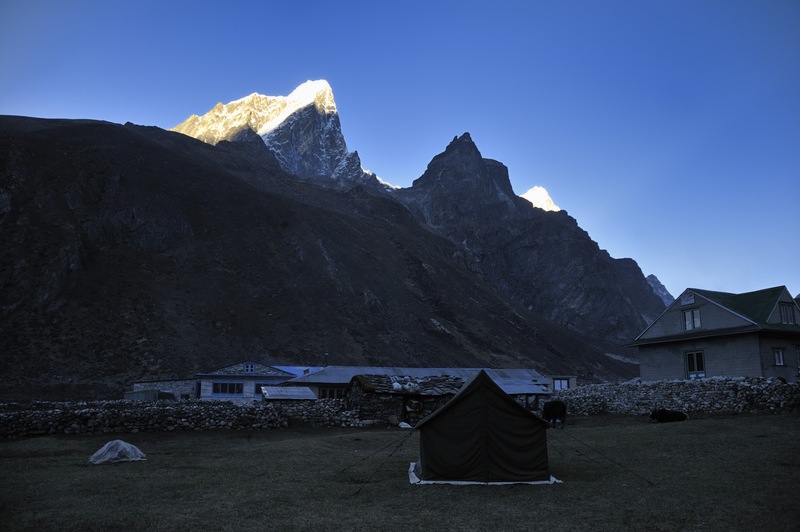 Phariche is extremely windy, and chill factor bring the temperature down to sub-zero at night. Onward journey towards Pheriche. 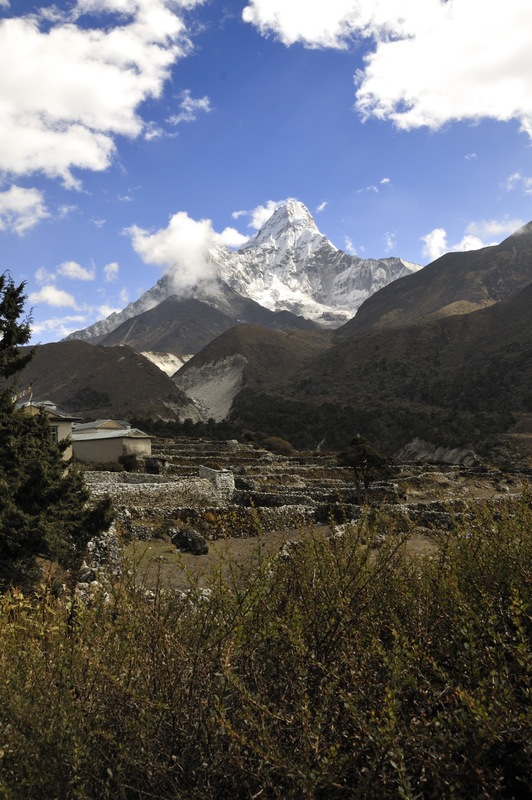 The majestic Ama Dablam is on the right, and Everest is not hidden on the left. Another stream, and we saw this local doing his laundry. Behind him is a hut for a prayer wheel power by the stream. You can never get tired of the view! The last bridge to cross for the day. 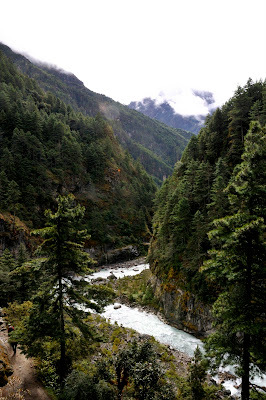 Bridge over River Khumbu. Our campsite, orange tents are the sleeping quarters, and the green is the dining tent. 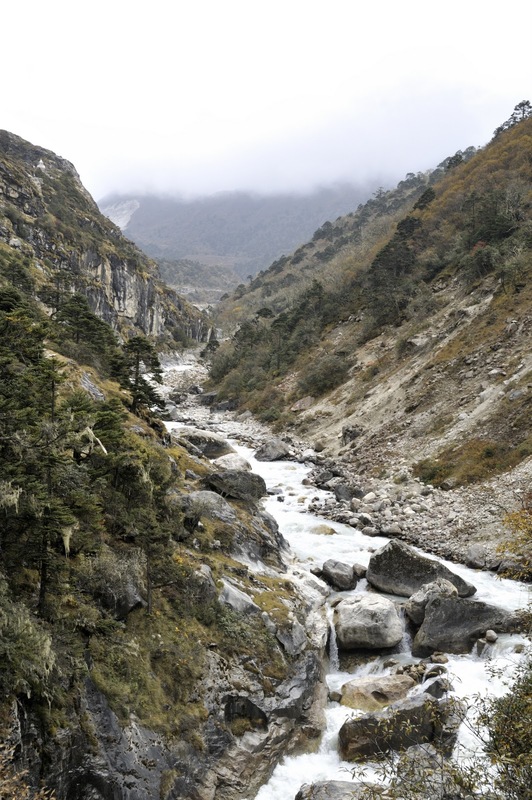 The nice thing about Phariche is that River Khumbu runs parallel to this little town, and the scenery was most fantastic. 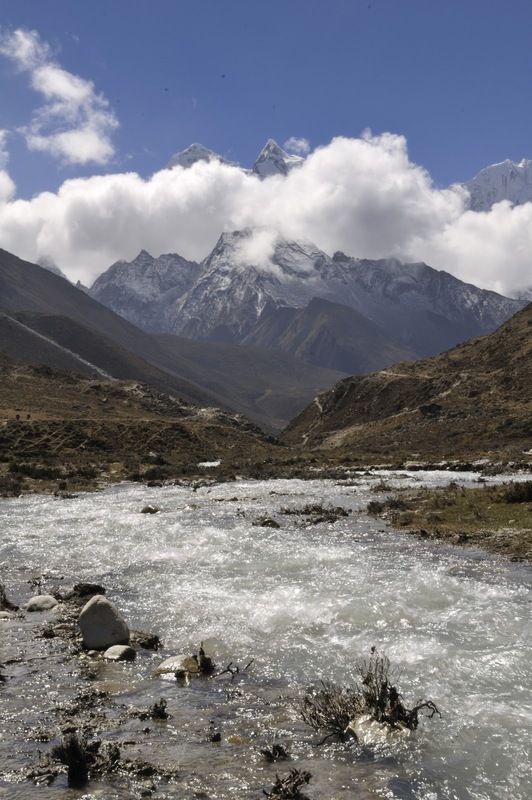 We spent this day at the brook (River Khumbu), and attend talks on mountain sickness. It was a good reminder for all of us, as mountain sickness can strike anyone of us who is foolish to move faster than the body can adapt. Recommendation is to ascend 400m per day to let the body acclimatise. 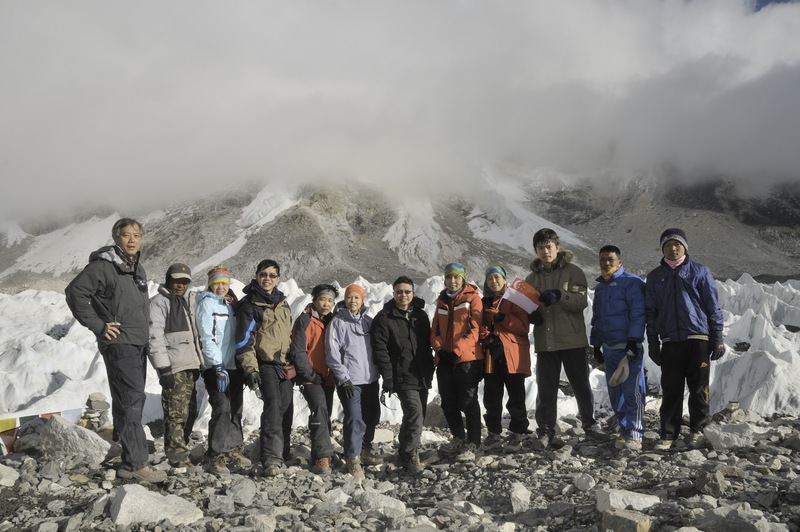 Our Support Staff - Guides, Cooks, Yak Drivers and Helpers. For most of us, we have now exceeded our climbing altitude record, as the highest most of the members have achieved was 4,095 m at Mount Kinabalu. Once again this morning, we were greeted by a beautiful orange cast on the mountain. As we were in the valley, the sunlight will take awhile to stream in. 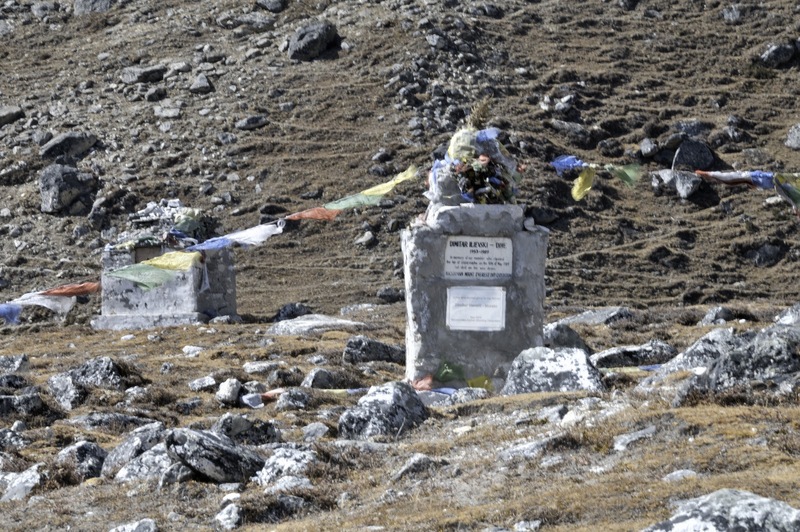 Memorial Stones of those who did not make it to the summit! A humbling reminder to all of us. At Lobuche, the air pressure is only about 60% of sea level, for us breathing was labourious but thankfully none of us were suffering from any severe mountain sickness. The occasional headache plagued us, which was resolved with paracetamol. 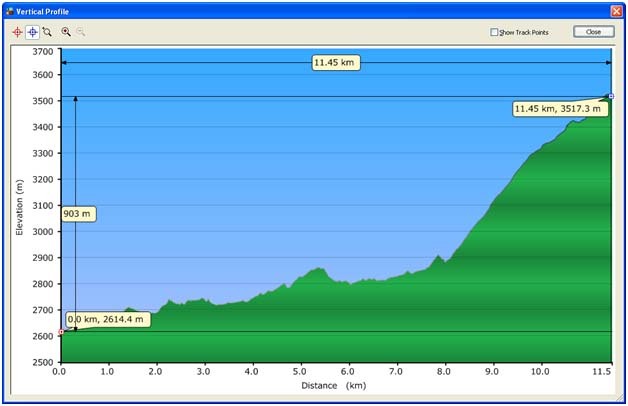 The climbing profile for the day, though we may have covered about 8 linear km, it is definitely more when the slopes are taken into account. Upon arriving at Lobuche, 3 of us decided to pay a visit to the Italian Pyramid. It is an observatory build by the Italian to study the atmosphere, glaciers. This "pyramid", we came to realise is fully equipped with medical equipment to deal with mountain sickness. So beside Pheriche, if anybody is taken ill at higher altitude, there is another medical centre. 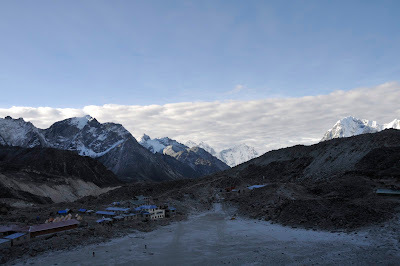 According to our schedule, we were supposed to rest at Gorak Shep, and then make the double ascend to EBC and Kala Patthar the following day. 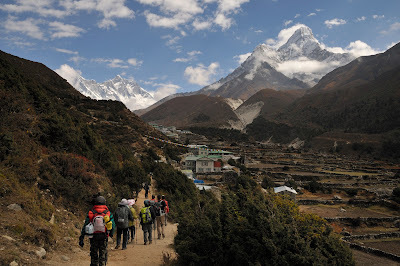 Prior to our trip, it was recommended to us to head for EBC, and attempt Kala Patthar the next day. This turned out to be a good decision, as at such high altitude, to attempt two summits will definitely drained our resources. The surrounding has turned into stones as trees no longer grow at this altitude. 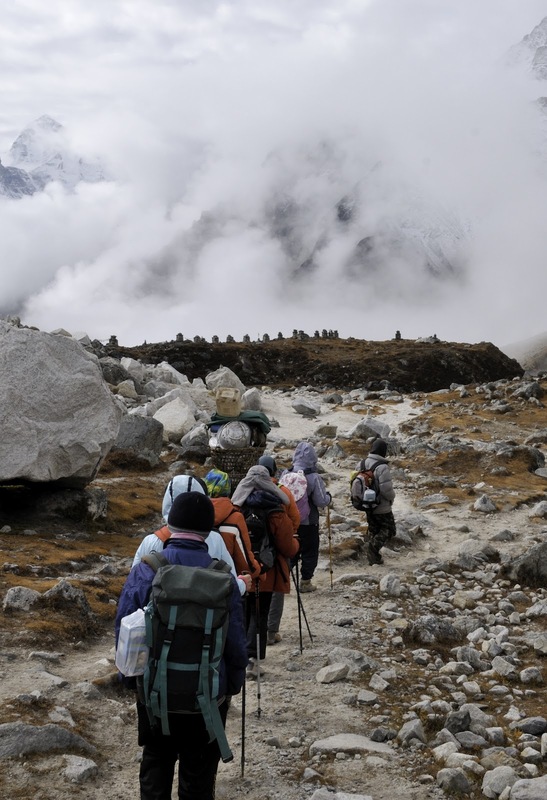 The other reason for that many stones, is that we are walking on past glaciers. The continuous grinding of rocks on rocks produce the sandy path that is to be our paths. The grooves that also formed our tracks, were probably made by rocks that have been pushed by the glacier. We walked in formation, with the slowest in front, and couple of fittest individual interspersed in between to provide support and encouragement. On the right, it used to be glacier. The ice has disappeared, and is now strewn with rocks. 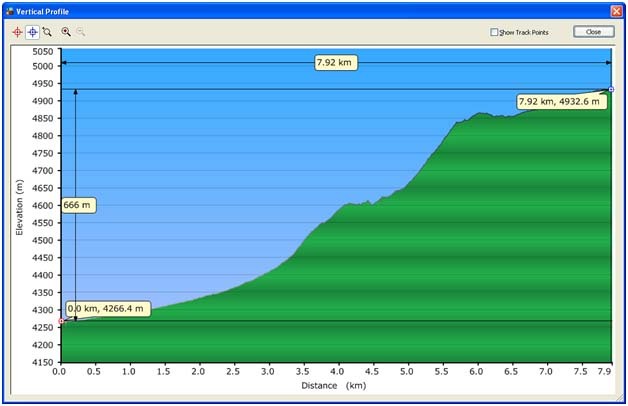 As can be seen from the climbing profile, the journey to Gorak Shep has alot of up and down. Rounding another bend, as we walked on the side of the mountain. 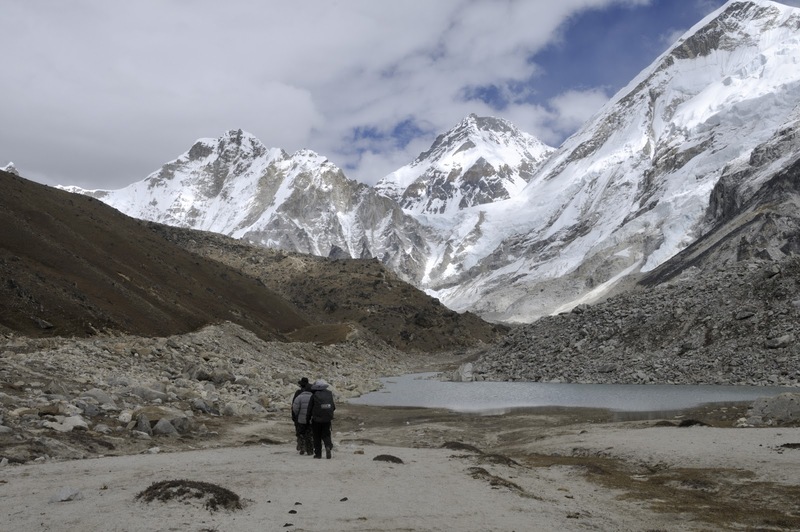 The Khumbu Glacier looks dirty, but where there are cracks and crevice, the permafrost can be seen. This picture was taken to illustrate the busyness of this track. We maybe 5,100 m high, but still it looked like a busy thoroughfare! We arrived at our Gorak Shep campsite. 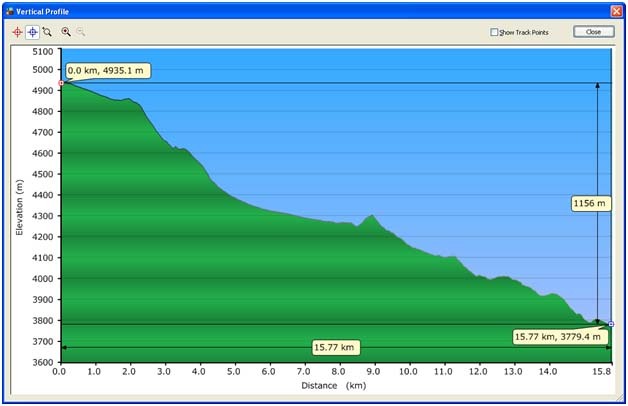 From Lobache to Gorak Shep, we were fast, it took us just under 4 hours. 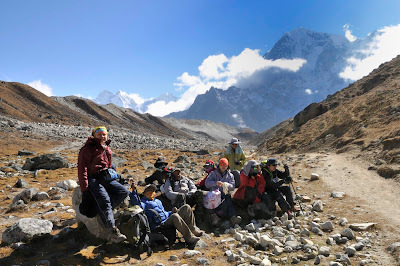 At Gorak Shep, we stopped for lunch, and then it was EBC! 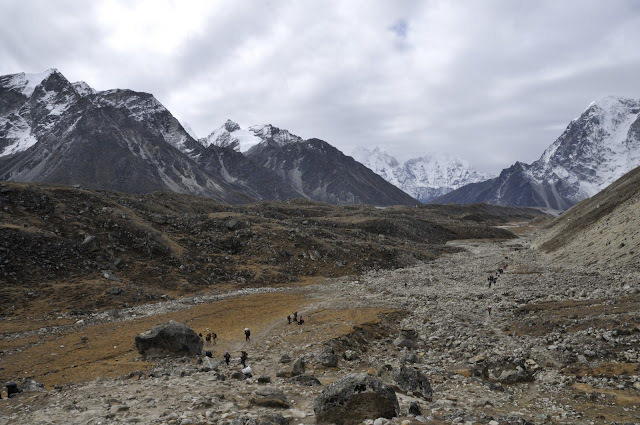 Starting from Gorak Shep, we have to walk through this flat plain of sand, according to our map, it was a glacier. Directly opposite where there are 2 tracks leading up, this will be our track to Kala Patthar the next day. At the end of the flat plain, we were walking on the side of the glacier. 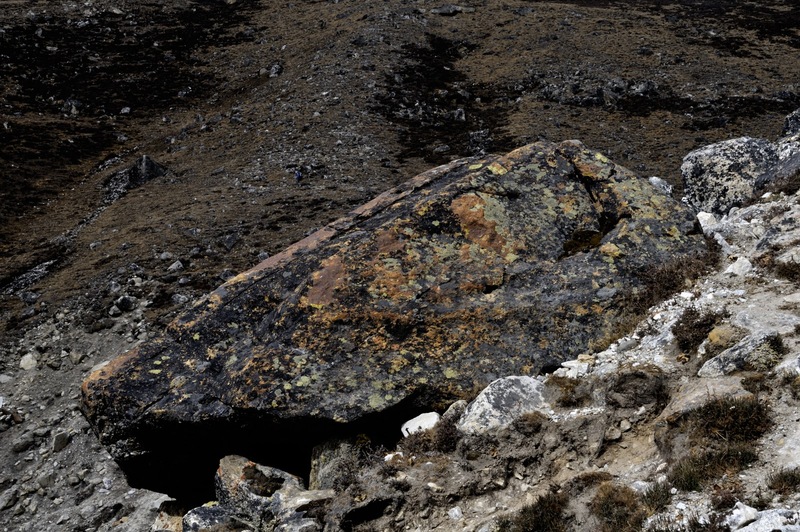 The different tone and texture of rocks indicate that is the glacier. When the soil is removed, the underneath is a beautiful bluish permafrost. Everest Base Camp would have easily passed by us, as there was no marking of any sort, except for small flags that were hung on a big rock, and somebody has written EBC on this rock. For this period, it was quiet, as the season for climbing Everest is over. 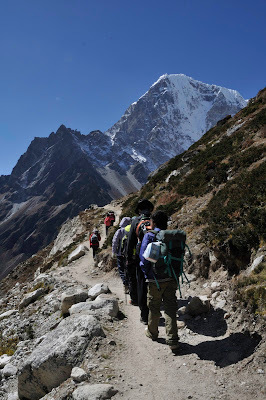 We reached EBC at 4:15 pm local time. It would have been great if the mist was lifted and Everest would have been right before us! It took us almost 3 hours from Gorak Shep, and we realised that we are going to walk back in darkness. Well that was what we did, we reached Gorak Shep at about 6:45 pm (local time). While walking back, those of us who were in front, saw a light bobbing towards us, we were wondering then - who in the right mind is going to attempt the EBC at such late hour. Surprisingly, it was one of the assistant cook, who has brought to us a kettle of hot cordial. It was the sweetest drink that we ever have, not only it energised us, it also warmed our beings! 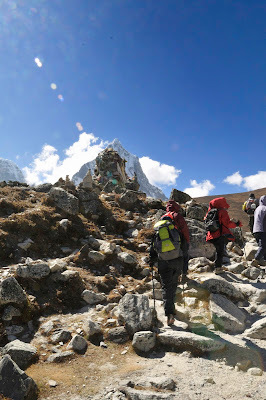 The highlight of our trip must be Kala Patthar, as this will be the highest point that we have achieved for most of us (except for one who had make it to Kilimanjaro that is closed to 6,000 m). The distance from Gorak Shep to Kala Patthar may be short but it was a sharp incline, but the journey for us was long. At that altitude, it was labourious just to walk. Today, we have a grueling task ahead, we need to ascend to Kala Patthar, after which we have to descend to Lobuche. 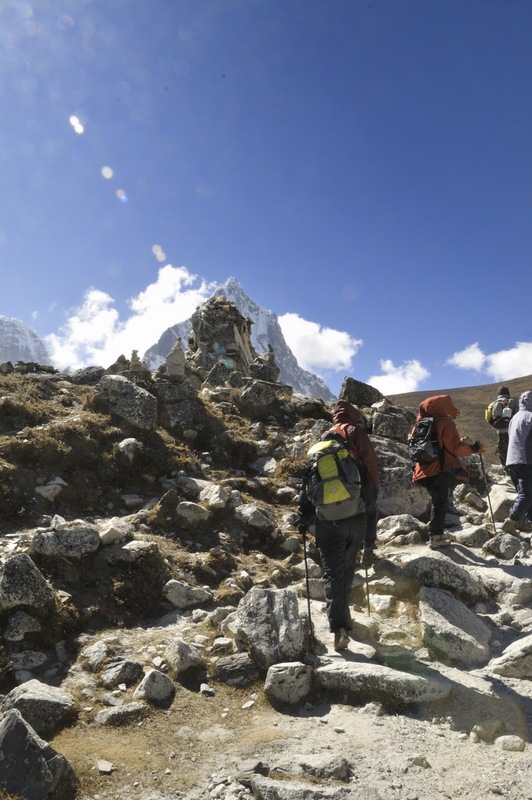 The walk up to Kala Patthar will sap much of our energy. Unlike in the other track, this was going to be up and up. 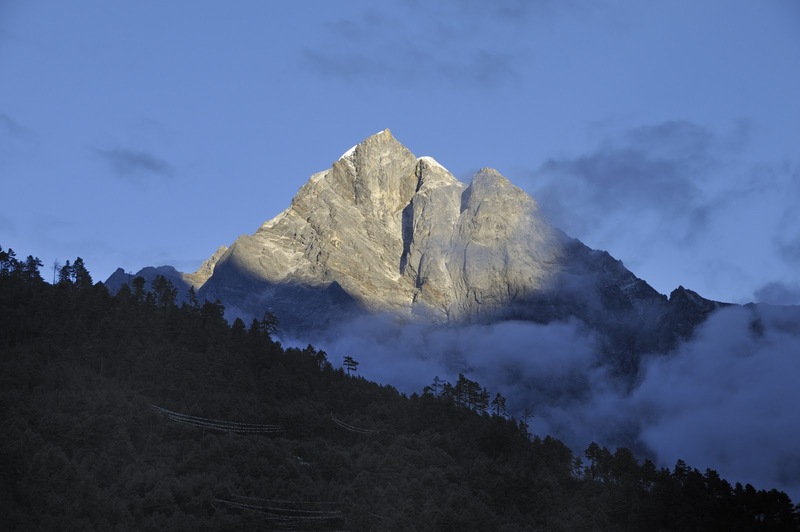 The other 4 team members have decided to give Kala Patthar a miss, and only the 5 of us decided to make this climb. A view of the sandy plain as taken from the Kala Patthar route. 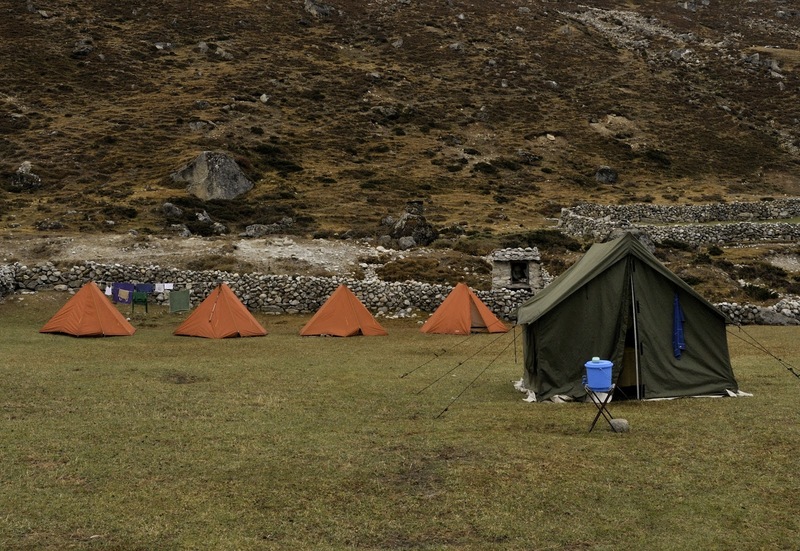 The opposite camp site is Gorak Shep. Normally there will be climbers attempting to climb at 2 am to catch the sunrise on Everest. For us, we were simply too tired and settled for a late morning view. Mt Everest - the 2nd peak from the left. 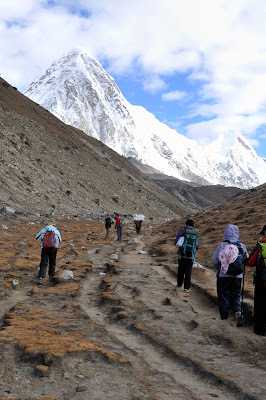 At 5,500 m, it was slow walk as we plodded up to Kala Patthar. Along the trek, as I turned back, I saw this Mont Blanc like mountain in the distance. It is the Ama Dablam. The Five of us at Kala Patthar (5,638 m or 18,497ft) summit. Officially we are now the 18ners. 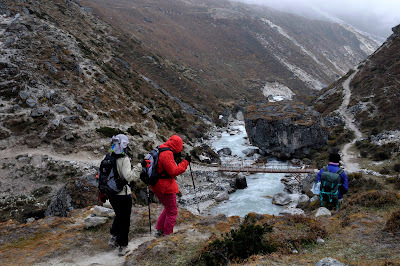 After the climb to Kala Patthar, the weather started to cold foggy and rainy. We were thankful that we have already made our climbs, and glad that it did rain at the beginning of our climb. We broke camp, and start our descend to Lobuche. From this moment onward, it was downslope and more oxygen. As can be seen, there were still snow on the ground, and getting very misty and cold. 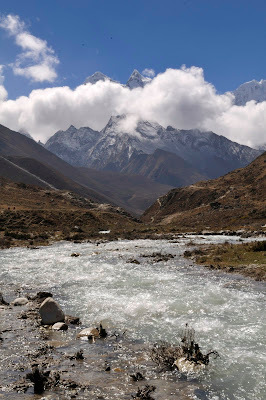 Heading back to Lobuche, and Ama Dablam peak will be the direction of our heading, if only the veil of mist was lifted. In front of us, were the memorial tablets dedicated to the fallen souls that have or were attempting the summit. 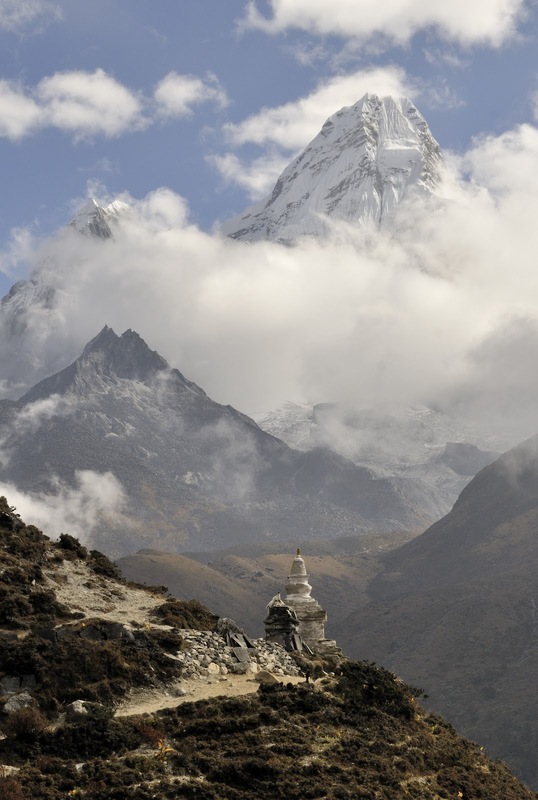 Yea... We can see Ama Dablam! For us, especially the 5 of us, we were tired but exhilarated. But at his moment most of us were not in talking mood. Simply tired, and our objective was to go as low as possible. Praying that the weather will clear. It has been wet and cold. 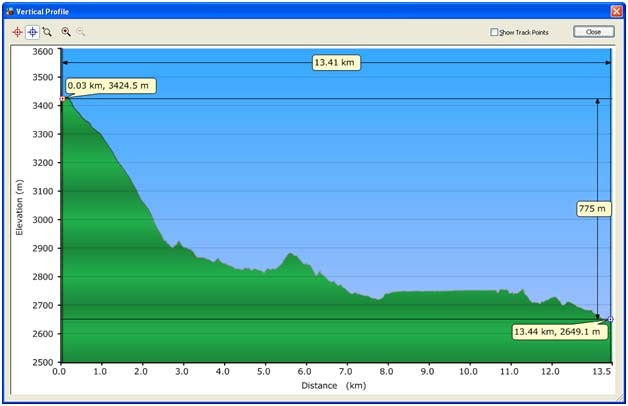 On this day, we descended more than a kilometre! We entered into Pheriche, the place with the medical centre and one of our team mate has to consult the doctor there due to bad cough. We were there for lunch, and then we pushed on to Devoche. 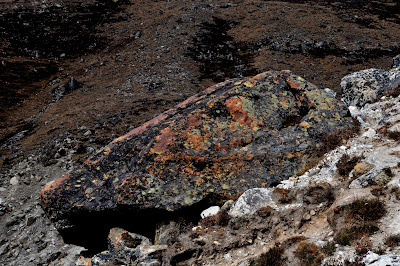 Pheriche was simply too windy, and still at 4,200m, may not be the wiser decision for somebody with bad cough! It had started to rain, and our main camera have to be kept. Wind was strong, notice the inverted umbrella. We told this team mate to put on the poncho, and throw away the umbrella. Though wet, this autumn scenery was much appreciated by us. Little house on the 'Prairie". We arrived at Devoche at the last light. Tired but happy. It has been raining the whole journey. Finally, when we retired to our tent, we also realised that our bags were wet. Thankfully, our waterproofing held, otherwise we will be most miserable. As one of our member was stricken with bad cough, we have to keep getting to low altitude to minimize altitude sickness, and to speed up recovery, as temperature will not be as cold as at higher altitude. This morning, as we broke camp. 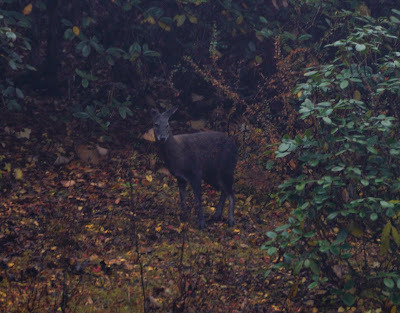 A musk deer came to visit us. Alas, the fog was there, and the picture taken was not very clear. Still you can see the teeth that jutted out of its mouth which is very characteristics of the musk deer. (Scroll down to the bottom to have a look). It must have not been that cold, for the there are still green on this tree. Typical 4 footed transport beside the 2 legged kind. 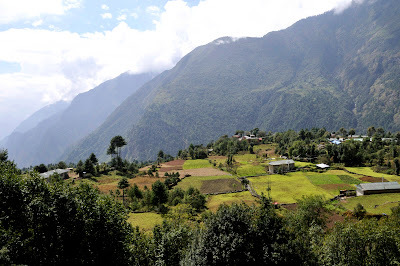 From Devoche to Namche, we will pass Tengboche again. 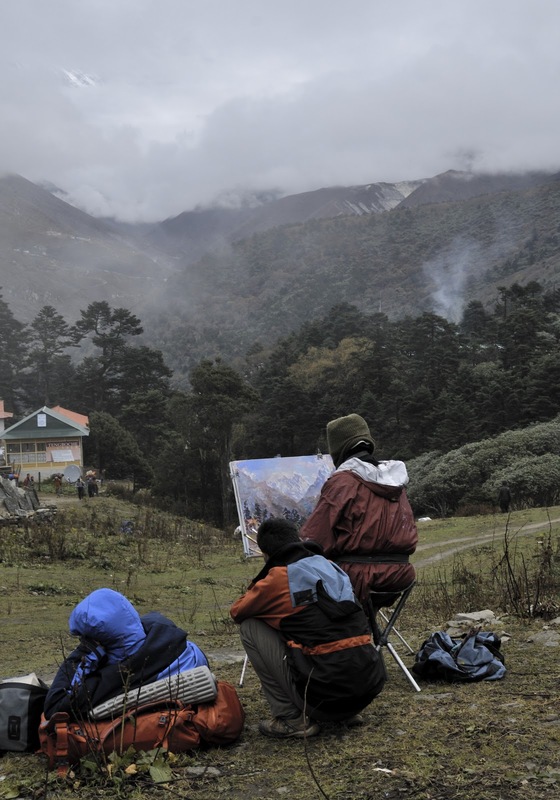 Here we saw this artist painting through his artistic vision of the mountain, for where we stand, the mountain was veiled with fog, but his picture was nice! The Entrance to Tengboche, is also our exit to Namche. If we could carry such load! From our guide in Blue, he was telling us that 25 kg per load is nothing to them, and we struggled with 10 kg! The Yak Express. 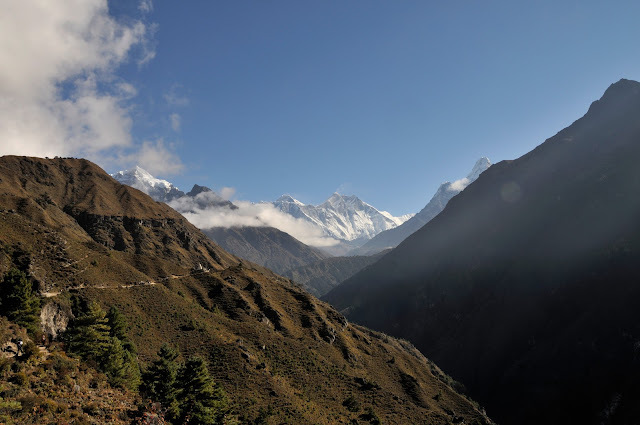 There are no roads, and all goods (unless it is taken from the mountain) are carried on the back of yaks, horses and human! 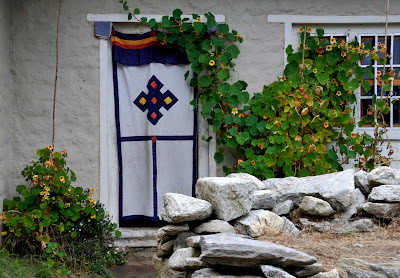 We had lunch at this lodge, typical of the houses, a cloth curtain hangs at the doorway. From Namche Bazar, it was back to our favourite place at Phakding. A grand river flows through here, and temperature was nice and cooling. We were much re-charged in our strength, and the journey back was filled with songs, dance and jokes. 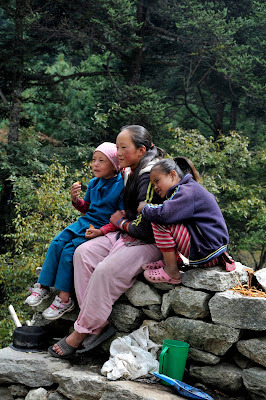 And along the way, we were met with the same beautiful charms of the local as well as the beautiful scenery to match. One of the many waterfall along the trail. A lodge is located here, and we have our "umplanned" lunch. Normally, the cooks and his assistants will be ahead of us, somehow due to communication breakdown, the equipment and cooks were way way ahead at Phakding, and since it was lunch time, we have no choice but to eat here. Actually, not a bad mistake! A local harvesting harvested potatoes. 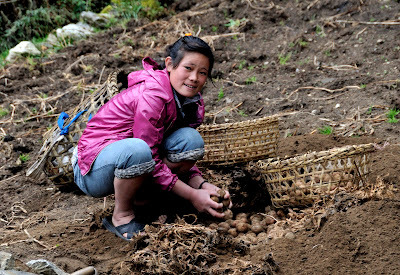 As Winter is approaching, the potatoes have already been harvested, but since there is no proper silo or fridge, the potatoes are placed back in the soil, these will not bud till spring, and can be kept fresh. On this hill side, there are many carvings (properly of prayer chants). 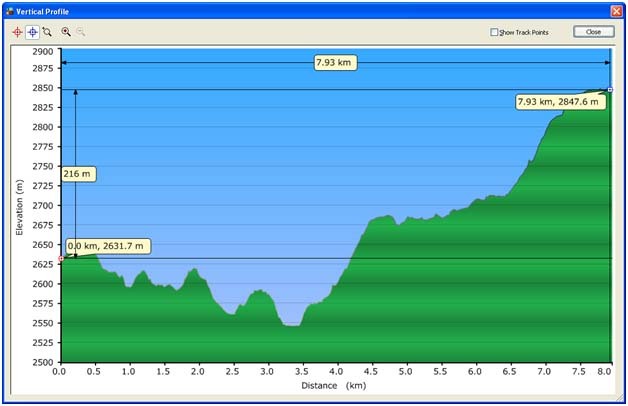 This is very near to the Checkpoint for climbing. 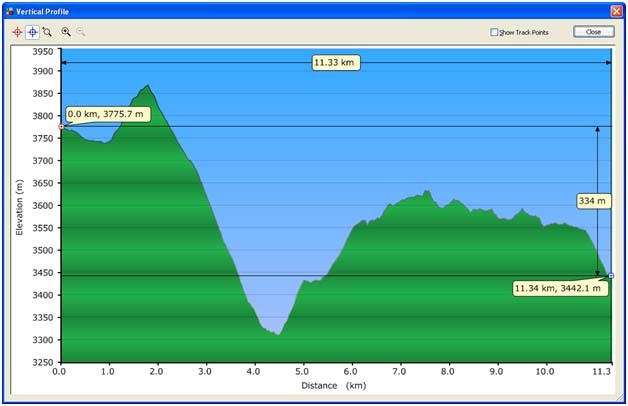 And the dreaded 220 m of up climb becomes reality! When we first started our climb on Day 1, we were conscious of the 200 m drop in our ascend to EBC, today was that day that we have to climb that 200m back to Lukla. Still with heart enlightened as we reached the end of our journey, this 200 m plus climb was nothing in comparison with what we have already done. 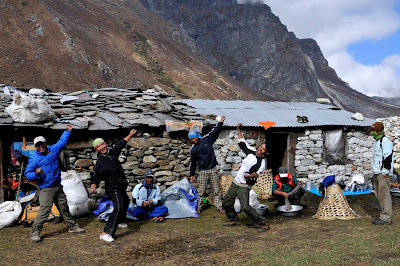 Back to our favourite lodge, we just cannot fathom that it was only a short moment ago, we were here eager to go to EBC! 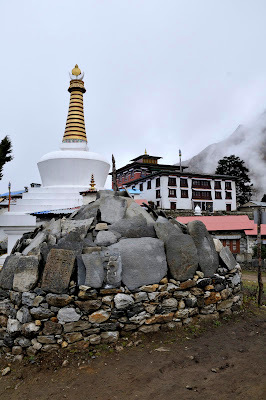 Lukla at last. The final destination. We have done it!!! Our last day sleeping in tent on the high mountain. Having lived in tent and in closed proximity with one another, a special bond will develop. Seeing each other strength and weakness, and complementing one another during this period, can only build the camaraderie for the next climb. There is no strong or weak members in the team, for the team members foster one another, and thus through this, can climbing be more enjoyable and provide the greatest satisfaction! As mentioned earlier, this is one of the most extreme airport due to the foggy weather condition. We have arrived at the airport hoping to catch our flight to Kathmandu, but flight was delayed from Kathmandu as it was foggy. After that it was another delay because Lukla was foggy. In all, we waited almost 4 hours for weather to clear, before we could catch our flight back. In fact most of the IDs are unknown to me. But at such high altitude, the UV light is very strong, thus making the colour of the plants to be very vibrant. At higher altitude, when the angiosperm ceases the Lichen reigns. Musk Deer - hunted for its musk to be made into perfume! 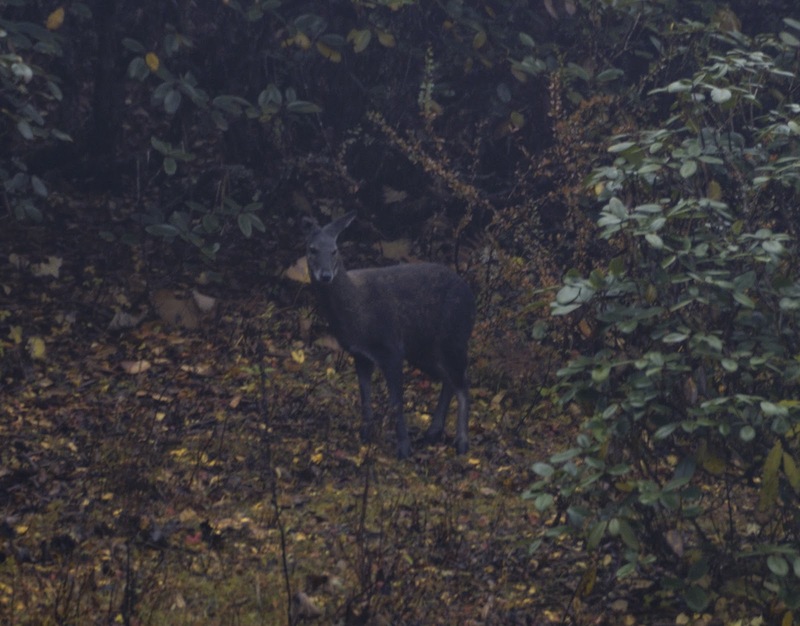 This Musk Deer visited us in the morning in Devoche just as we have just broke camp to start our journey to Phakding.. Thanks to Rainbow and James for allowing me to use their pictures. 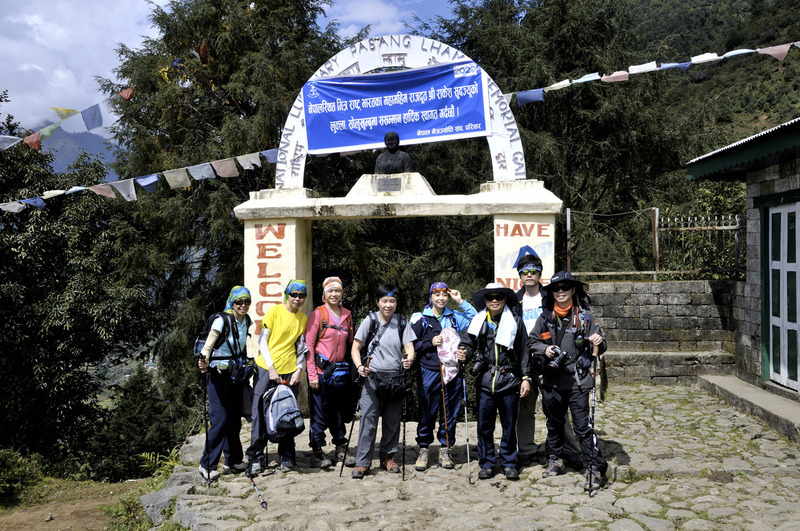 Tiong Chin, thank you for the great effort to put together all the details of treking in the blog. I have visited this blog many many times. I am so proud to share with my family, relatives, colleagues and friend of my " impossible mission"
Hi Suan Tee, thanks. Impossible Mission at the beginning. 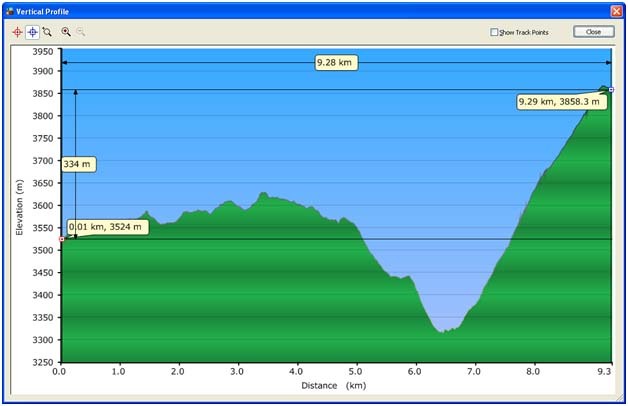 But then as you recalled, it was 4,095 m that you have managed to reach in 2008. And now 5,291 m at EBC. So aim for the next "impossible mission". 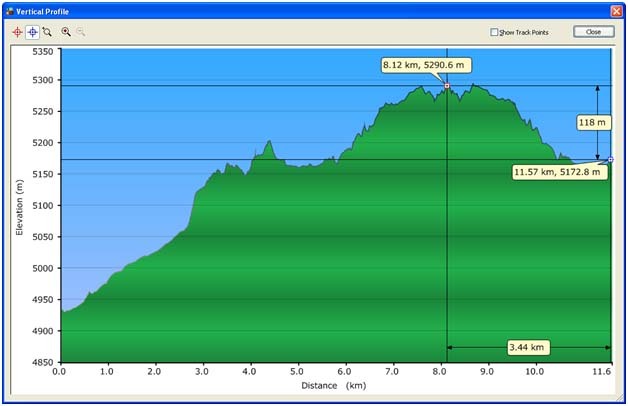 like Kilimanjaro at 5,900 m.